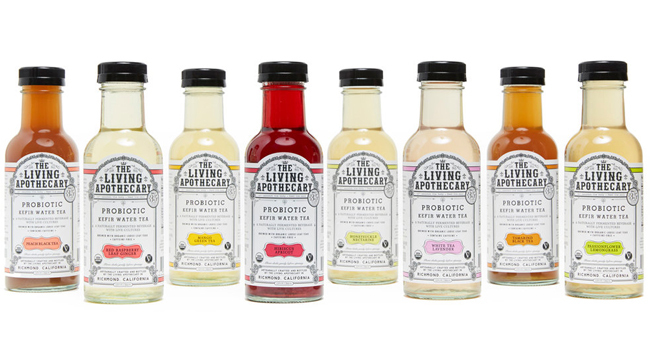 Probiotic water kefir maker The Living Apothecary has raised $1.4 million in a fundraising round led by L.A. Libations and Venice Brands, setting the brand on a path to triple its distribution over the next year. Founded in 2012, The Living Apothecary first partnered with beverage incubator L.A. Libations in May to grow the brand’s presence throughout California. Speaking with BevNET, L.A. Libations EVP David Meniane said the new funding round will fuel the brand’s next growth stage. That will include moving from in to a new 23,000 square foot facility, making investments in marketing and merchandising, and hiring new sales, finance, and production team members, including a senior director of sales who will be announced in January. LivWell Ventures also participated in the funding round. Since partnering with L.A. Libations, the brand has entered H-E-B stores in Texas in the retailer’s kombucha set. The Living Apothecary is also launching with Pavilions in California, Safeway/Albertsons, and will be entering several new national retailers over the next month, Meniane said. He added that L.A. Libations is taking an active role with the brand, guiding its finances, operations, strategy, sales and distribution, as well as holding a seat on its board of directors. “We’re definitely taking into account the fact that now we have adequate capital to scale the business,” Meniane said. Shari Stein Curry, co-founder of The Living Apothecary, told BevNET that the investment will help the brand grow its retail presence beyond its California base. The brand to date has been run without outside funding by a small team led by Curry and co-founder Traci Hunt, but has carved out a space in the gut health beverage set as an alternative to kombucha. According to Meniane, the goal now is to triple the size of the business over the next 12 months. The brand has performed well in the natural and specialty channel he said, however the company now wants to target select stores and premium product sets in top national retailers. He added that the company will focus much of its marketing on sampling, merchandising, and in-store support to grow the brand outside of the Los Angeles area. The brand will also be updating its bottle and label, a change that will happen sometime in the next six months, Curry said. The company will also relaunch its website and introduce digital marketing campaigns. As The Living Apothecary moves forward, however, its focus will be fully on its water kefir teas, as its cold pressed almond milk line will be discontinued. Curry said she was disappointed to be ending production on the line and hopes to bring it back in the future.